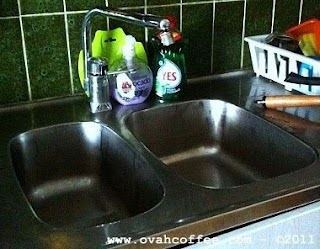 Ovah Coffee: Stainless Steel Sinks Rock Kitchens! Stainless Steel Sinks Rock Kitchens! 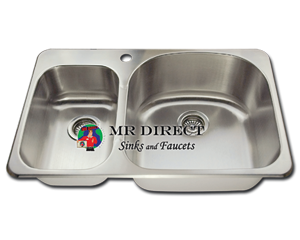 Here in Sweden, stainless steel sinks [http://mrdirectint.com/] are popular in many kitchens. Houses [both old and new] and apartments usually have the double sink type [just like on the photo below] in which one of the bowls are a bit smaller than the other while restaurant kitches and bakeries go for the double same-size sink type. I have to say, I find this type of basin more handy than the tiled sink that we have back home in the Philippines. With the four simple reasons stated above, now you know why stainless steel sinks rock kitchens! I'll post a photo of our kitchen sink tomorrow. I haven't done the dishes for tonight and I'm really not up to doing it today. It's almost 12 midnight and it's already past my bedtime. I refuse to publish a dirty sink on here... if you know what I mean. So, tomorrow it is! ... until tomorrow morning guys! Nighty nighty!